By Tara Callaway | I posed a question to high school students during a presentation on desert tortoise at Joshua Tree National Park in 2016: How would you deal with the issue of ravens eating desert tortoises? I received a multitude of feasible answers, which showed me that these students understood the issue. However, when I heard the response, “Why don’t you feed ravens to keep them from eating desert tortoises,” I was taken aback. 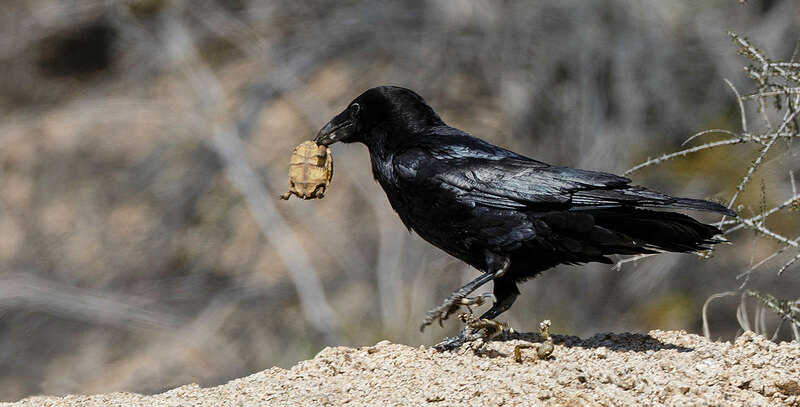 Photo above: Raven eating a juvenile tortoise in Joshua Tree National Park. Photo by Kevin Powell. I have worked as an Interpretive Ranger for the National Park Service, and it has been ingrained in my head to not feed the wildlife and to prevent park visitors from doing it as well. The student’s response seems logical, and it clearly underscores the gap in outreach and education that we face in addressing the impact of ravens on desert tortoises. If we fed them, they would be full and leave the desert tortoise alone, right? Well not quite, but I wish the solution was that simple! I told the students that feeding them is not the answer and why – they already have plenty of natural food sources like lizards and bird eggs. In addition, human food and agricultural wastes, which can be lumped into “human-caused subsidy sources”, have been major factors in the exponential growth of raven populations over the past four decades. Feeding them is really the last thing we want to do. While their numbers are elevated in the desert due to human-caused subsidies, they will continue to eat an enormous number of juvenile desert tortoises. After the presentation, I went home and reflected on all of the students’ questions and answers. Mostly, I thought about how the students were surprised that ravens prey upon juvenile desert tortoises and that the raven population has grown 1,500% since the 1970s. Early explorers documented rarely seeing ravens in the Mojave Desert, but that is sadly no longer the case. As an Endangered Species Biologist for the U.S. Fish and Wildlife Service, I believed everyone in the desert knew these facts. As professional biologists, we are often unaware that the public is not as focused on the same issues we are. However, if students living in the desert their whole lives didn’t know that ravens are eating our precious desert tortoise (California’s state reptile!) and that raven numbers have skyrocketed in the last 40 years, we obviously need to get to work to get the word out. Outreach and environmental education cannot be underestimated in their power. If all students, and subsequently their parents, knew about ravens preying upon desert tortoises and why ravens are a huge problem, then a monumental change could occur in the desert. Perhaps people would ensure their garbage lids were closed to prevent trash being picked apart by ravens or blown across the desert. Maybe people wouldn’t feed ravens in their backyards. I bet more than a few people would reconsider leaving their leftover food next to an overfilled trash can at a gas station where ravens were perched nearby waiting for them to leave. Ocotillo patch in Joshua Tree National Park. Photo by Bret Greenbeck. Getting the word out isn’t as easy as it sounds though. Sure, you could print brochures and post some educational pieces on social media, but the people reading the brochures and following your Facebook accounts are already on board with your message. They know that feeding ravens equals more ravens in the desert, which consequently means more predated desert tortoises. The question is: How do we reach people who don’t routinely think about desert tortoises and environmental issues in the desert? In partnership with The Living Desert Zoo and Gardens in Palm Desert, a part of my job with the Fish and Wildlife Service is to get the word out to people in rural desert towns and cities. This includes the use of social media, local events, outreach to recreational groups, interpretive signage, and any other means we can envision. If we can help desert dwellers make the connection of their leftover food equaling more ravens and subsequently less desert tortoises, then we are on a path to helping the desert tortoise survive another generation. Beyond outreach and environmental education, we have still more work to do to reduce raven populations in the desert. Here is what “we” are doing, and by “we”, I mean numerous government employees, conservation organizations, contractors, and desert residents. We are monitoring ravens throughout the California desert in an attempt to understand more about them. For example, data is being collected in conservation areas on their nest locations, fledgling success, and nesting substrates. We hope this data can help guide management actions that would keep ravens from accessing human-caused subsidy sources through deterrence methods or by “teaching” ravens that desert tortoises should not be a meal. Because ravens are one of the most intelligent birds in the world, we hope they learn this lesson quickly and pass on the message. Speaking of human-caused subsidy sources, we are also trying to either remove subsidies or greatly reduce their impact. This includes removing defunct powerlines used as nesting substrates in pristine desert tortoise habitat or replacing open trash bins with wildlife-proof bins. We know that flashing a green laser at ravens causes them to abandon feeding areas, without injuring them; maybe farmers can strategically use lasers to protect their crops and reduce the ravens’ food supply. If we can get all the folks in the desert to reduce or remove human subsidies, we could rapidly reduce raven abundances. Ravens are an issue all across the west, but our goal is to make the desert a less ideal place for them. Taken in Death Valley National Park. The raven was watching the author eat and waiting for food to be left behind. Photo by Bret Greenbeck. Decreasing human-caused subsidies is vitally important to reducing raven overpopulation, but cannot be done without outreach to and environmental education of desert dwellers. The raven issue is a complex, evolving issue and literally involves a moving, hyper-intelligent target inhabiting millions of acres. Without everyone’s cooperation (and honestly, their enthusiasm as well) in limiting raven populations, the desert tortoise is going to have a very bumpy ride towards recovery. How can you help? Stash your trash and leave no trace! Desert tortoise recovery is one of my main responsibilities as an Endangered Species Biologist with the U.S. Fish and Wildlife Service. To support desert tortoise recovery, I need to get people connected, find funding for recovery projects, and provide outreach and environmental education across the desert. I appreciate any and all help! My goal is that within 5 years’ time, students are no longer surprised by the fact that ravens eat desert tortoises or that the superabundance of ravens is harming other species. My goal is that the students will be telling me what they are personally doing to reduce raven numbers or other ways they are helping desert tortoise. The findings and conclusions in this article are those of the author and do not necessarily represent the views of the U.S. Fish and Wildlife Service. Tara Callaway has worked as an Interpretive Park Ranger for Joshua Tree and Mount Rainier National Parks and currently works for the USFWS Palms Springs Field Office as an Endangered Species Biologist. In her free time, she’s hiking and traveling with her husband Bret and their 4 month old baby boy, Cedar.